Puzzle: This puzzle is not very exciting to do due to dull grays of the building and the dark greens of the bushes and trees occupying the most of the picture, but Sure-Lox pieces fit together well and the size is small enough to not present a challenge. I just wish the photograph had more colour and contrast in it to really highlight the beauty of the old architecture. The sequence of assembly could start with the sky and its boundary with the roof and the trees, and with the grass and its boundary with the flowers. The border between the building and the bushes provides a good horizontal guide, and the tall windows can serve as vertical guides. From that point on, the picture is trivial to assemble. Notes: I no longer have the puzzle box, so I’m unsure where this church is situated (there are plenty of Trinity churches around the world, it seems). If you have any information on the location of this building, I’d love to know. 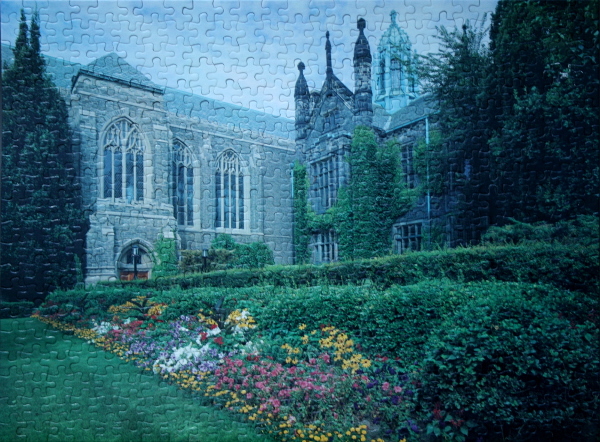 church, flower, garden, puzzle, tree. Bookmark.